The global coatings resins market was valued at $35,101 million in 2017, and is projected to reach $52,901million by 2025, growing at a CAGR of 5.3% from 2018 to 2025. Coating resins are covering applied on the surface of object to achieve hardness, corrosion resistance, weather resistance, and stain resistance. Resins offer quick drying times, gloss retention, and superior weathering to coatings. Increase in architectural coatings demand drive the growth of the market. In addition, rise in demand for green and environment-friendly coating systems in architectural designs is expected to boost the market growth. In the roadways marking, there is a high demand for coating resins owing to its weather resistance properties, which in turn is responsible for reducing maintenance cost of roads. The increase in production of automobiles is also another factor expected to escalate the growth of the coating resins market. The automobile manufacturers utilize coating resins for coating heavy or light duty vehicles as well as passenger cars to achieve mechanical strength, adhesion to metals, and heat resistance. In addition, there is a growth in trend of manufacturing furniture that is appealing and resists humidity and pests. Therefore, furniture industry is increasingly using coating resins for varnish wooden structure. The factors that hinder the use of coating resins include fluctuating raw material prices and depleting petrochemical reserves. These factors hamper the growth of the market. However, the global coating resins market is yet to explore its full potential. Factors such as development of bio-based coating and stringent regulations and industry participants beholding eco-friendly coating to maintain image of their respective company is projected to possess future growth opportunities to the market. Based on resin type, the market is categorized into acrylic, epoxy, polyurethane, alkyd, vinyl, unsaturated polyester resin, saturated polyester resin, and others. Based on technology, the market is divided into waterborne, conventional solvent borne, high solid solvent borne, powder coating, radiation cured, and others. Based on application, the market is classified into architectural, industrial, protective & marine, automotive OEM, vehicle refinish, and others. Based on region, it is analyzed across North America, Europe, Asia-Pacific, and LAMEA. The key players operating in the market include Bayer AG, Royal DSM, The Sherwin-Williams Company (The Valspar Corporation), and Polynt SpA. Other prominent players include Allnex Belgium SA/Nv, Arkema S.A., BASF SE, Momentive Specialty Chemicals, Inc., The DOW Chemical Company, and Evonik Industries AG. 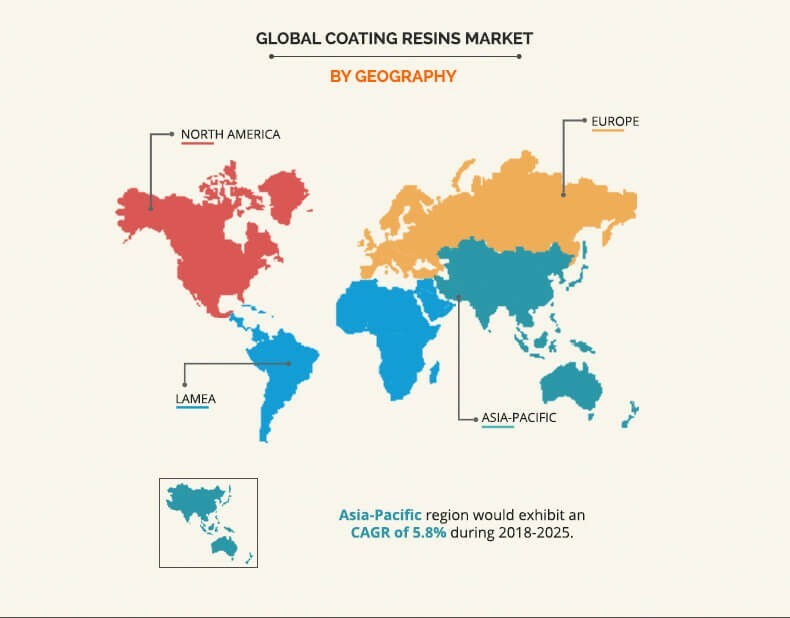 Asia-Pacific coating resins industry is anticipated to witness high growth rate during the forecast period owing to rapid economic development and growth of construction projects in the Asia-Pacific region. The radiation-cured coating resins segment is projected to be the most lucrative segment, as these coatings contain lower volume of VOCs. 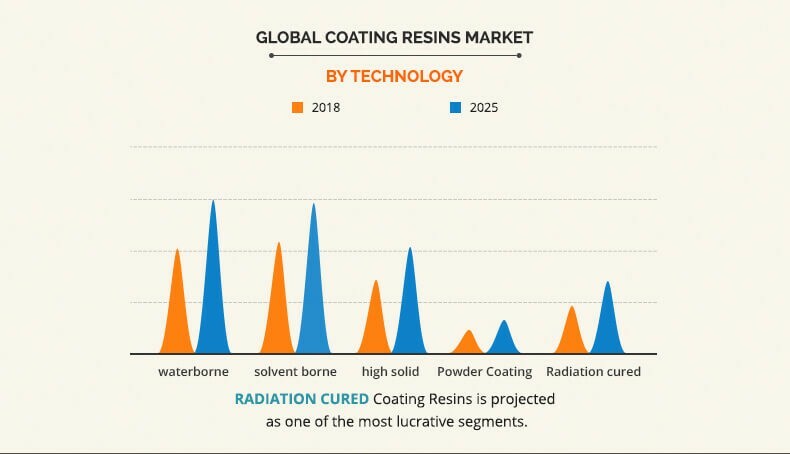 The market for radiation-cured coating resins is expected to grow owing to faster curing time, and produce durable and high-quality coating. Furthermore, radiation-cured coating resins are used to manufacture scratch, impact, abrasion, chemical, and mechanical resistance coatings. Based on application, the architectural segment is estimated to grow at the highest CAGR during the forecast period. There is an increase in the demand for architectural coating owing to the growth of the housing market. This in turn is anticipated to increase the demand for coatings resins used in architectural coating. Porters Five Force's analysis helps analyze the potential of buyers and suppliers and the competitive scenario of the industry for strategy building. 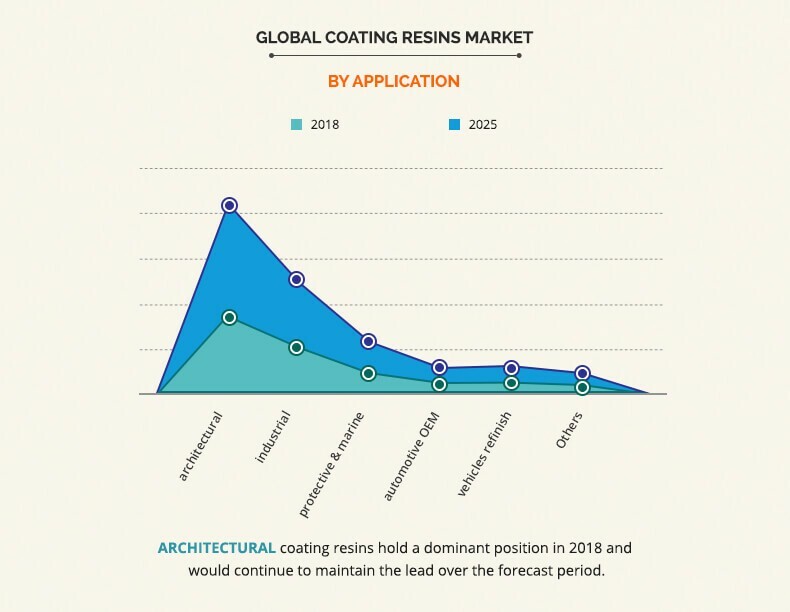 It outlines the current trends and future scenario of the coatings resins market from 2017 to 2025 to understand the prevailing opportunities and potential investment pockets. An in-depth analysis of the current R&D is provided along with the key dynamic factors. The key drivers, restrains, and opportunities and their detailed impact analyses are elucidated in the study. The profiles of key players along with their key strategic developments are enlisted in the report. 3.5.3.1. Stringent regulations towards green initiatives. Coating resins are applied on the surface to achieve properties such as adhesion, wettability, corrosion resistance, and wear resistance. The global coating resins market has reported a significant growth in recent times. The rapid rise in the global automotive industry and increase in demand for green and environmental friendly coating products across wide sectors such as architectural, industrial, protective, and marine fuel the market meaningfully. The global coating resins market is segmented into polyurethane, acrylics, epoxy, alkyd, and polyester resins. These resins are utilized in various end-use applications, thus playing a prominent role in boosting the growth of the market. The use of environment-friendly products is also one of the growing trends in the market, majorly influenced by stringent regulation regarding elimination of volatile organic compounds (VOC) emission in coating resins. Due to these regulations, the demand has lifted from solvent-based coatings to environment-friendly coating such as powder-based, water-based, and UV curable coatings.